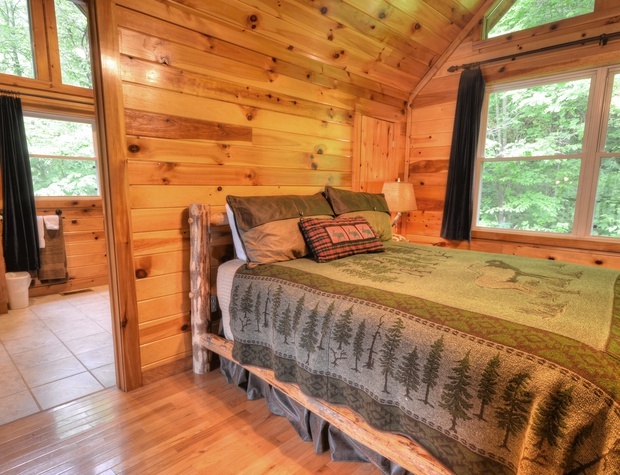 This cabin is very private and secluded. 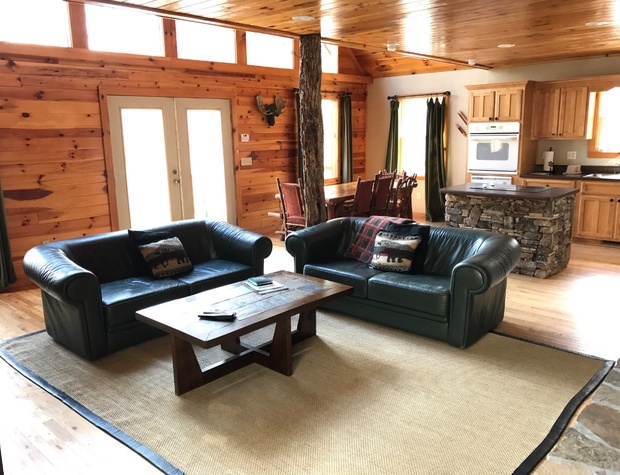 It’s only 13 minutes to the 4-lane highway at Exit 64 (Alarka Rd), where you’ll be well on your way to all area attractions and conveniences. 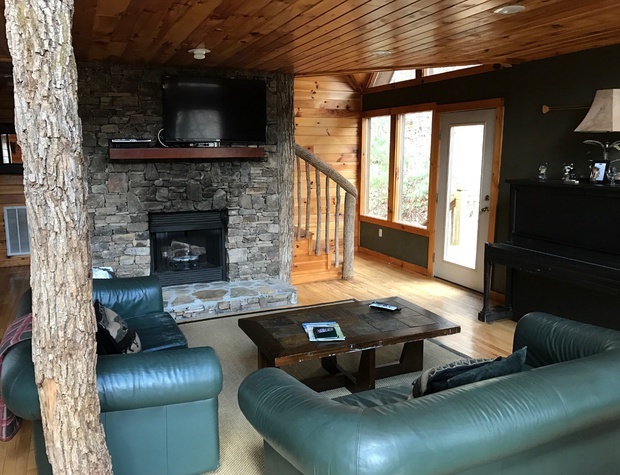 This 2 bedroom cabin offers the value of lots of additional sleeping, plus Foosball and plenty of TVs to keep the crew busy if you’re not out and about the area. 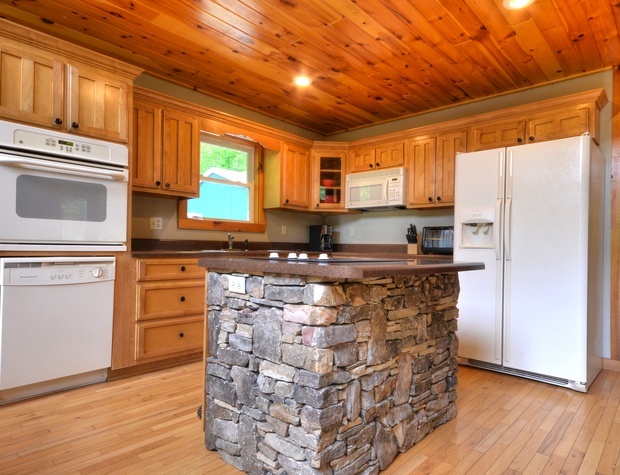 Your kitchen is appointed with all appliances including dishwasher, microwave, wall oven, cook-top and or course the small conveniences of a coffee grinder and maker. 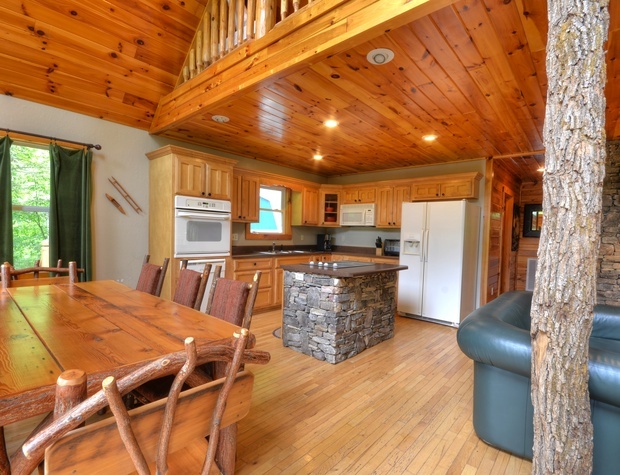 There is an island counter with bar stool seating for 2 in addition to a log cabin style dining table that seats 6 comfortably, but can pack more on the bench, if you are needing large family-style seating. We provide you with all the dishes, utensils and cooking tools you’ll need. A gas grill is provided for BBQ connoisseurs (full propane tank included). 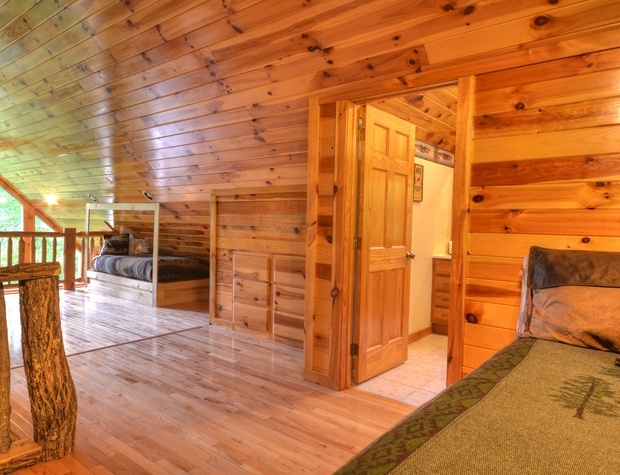 The great room is a 2-story, vaulted room with the loft overhang above. 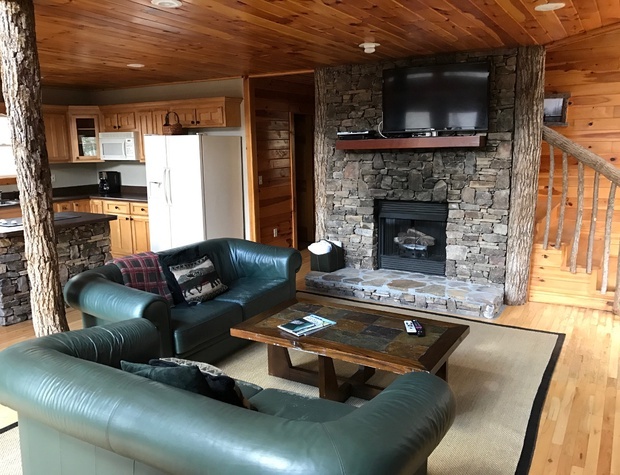 It features large living and dining area with the kitchen and dining as described above sharing the open area with a comfortable fireplace (gas logs) seating area for family enjoyment. 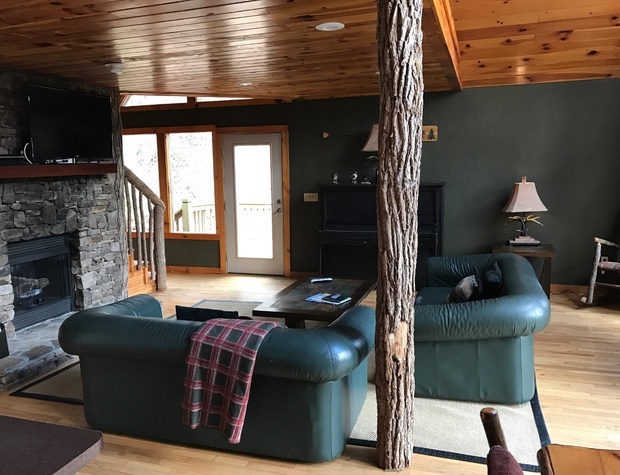 There is a sofa bed and 2 love seats for fireside stories or satellite TV watching, and large windows in the vault to bring the outside in. 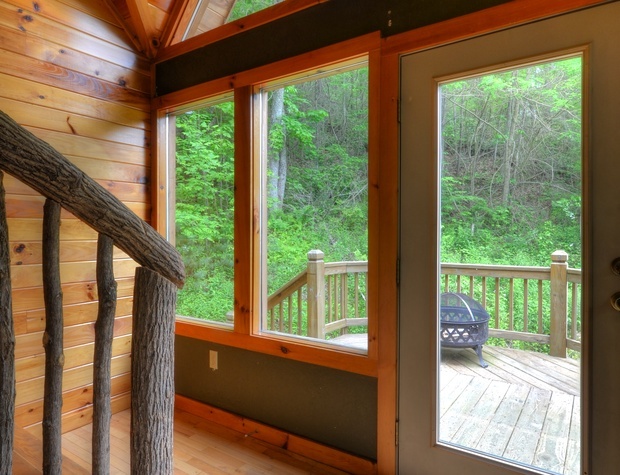 The modern-rustic decor includes hardwood floors, rock fireplace and log-wall interiors. 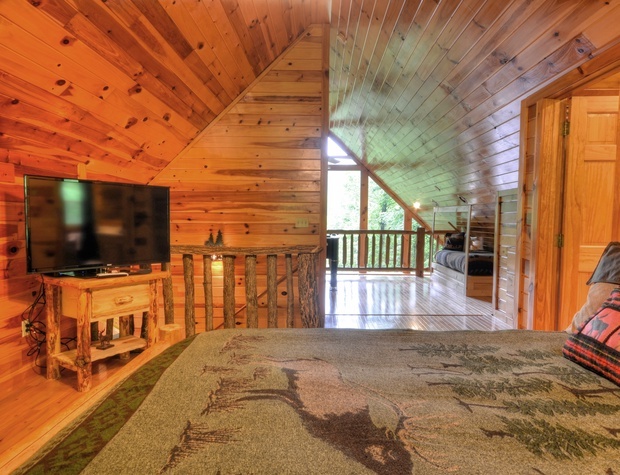 There is DirectTV system with premium movie and sports channels and a CD/DVD player. Bring your own music or listen to one of the dozens of digital music channels provided by digital satellite. 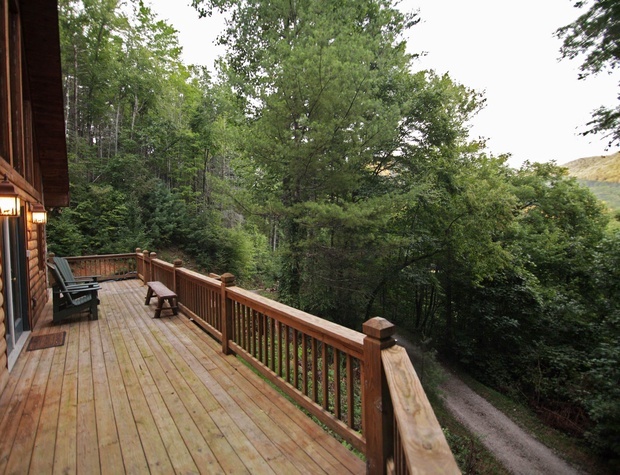 The great room opens to the front deck that wraps around to the side yard featuring the hot tub. 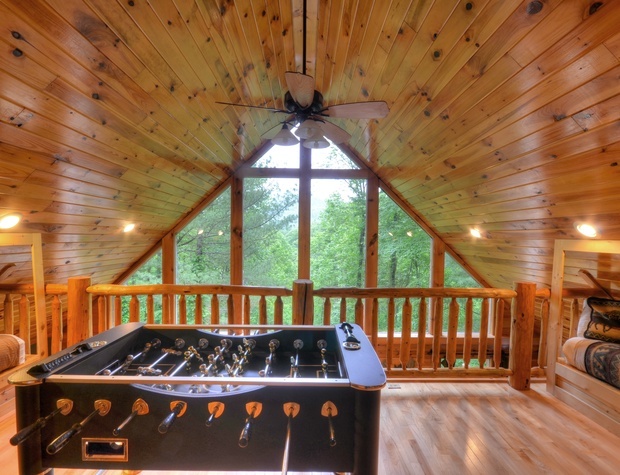 Above the great room is the open loft area that features another TV and Foosball table, plus fun twin bunk sleeping in the alcove twin bed nooks built under both sides of the sloping vaulted ceilings. Note: the piano is not kept in tune. 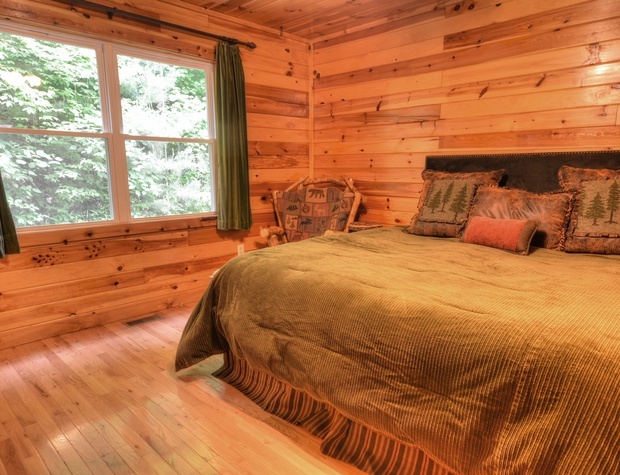 All our cabins feature both down and foam pillows as well as down comforters. Each bed has a pillow-top mattress with thick pad and luxury, 600 thread count, Egyptian-cotton linens. Ralph Lauren bath towels are provided for the base number of occupancy with additional towels for hot tub use. 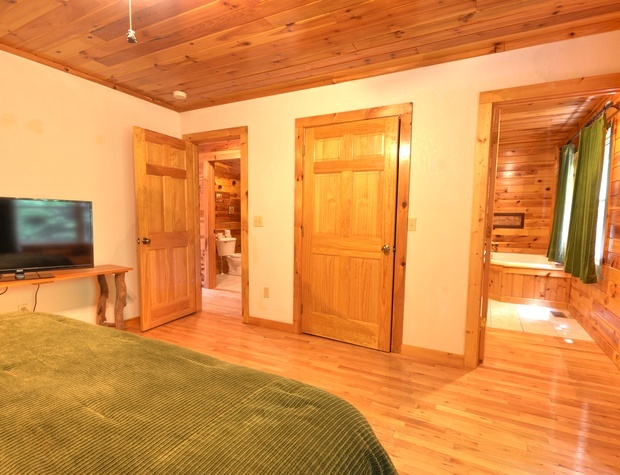 Linens and towels for guests utilizing the futon(s) or sofa-beds for sleeping are provided for when occupancy is greater than the base amount of this cabin, but use of these linens when occupancy doesn’t warrant it may result in additional charges as defined on our reservations page. 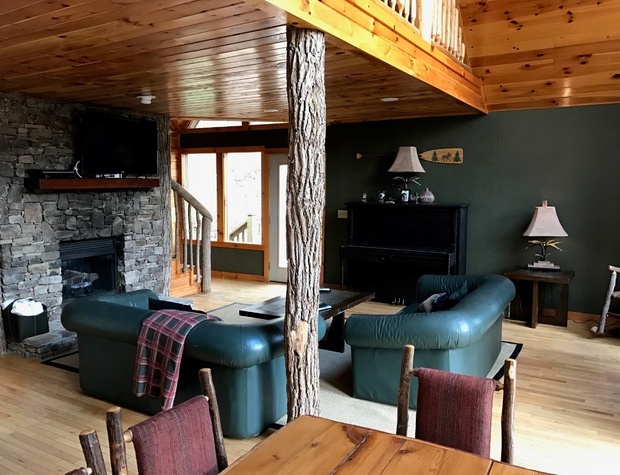 In addition to the living/dining/kitchen area, the main floor has a king bedroom with master bathroom featuring a large garden tub and separate shower stall. 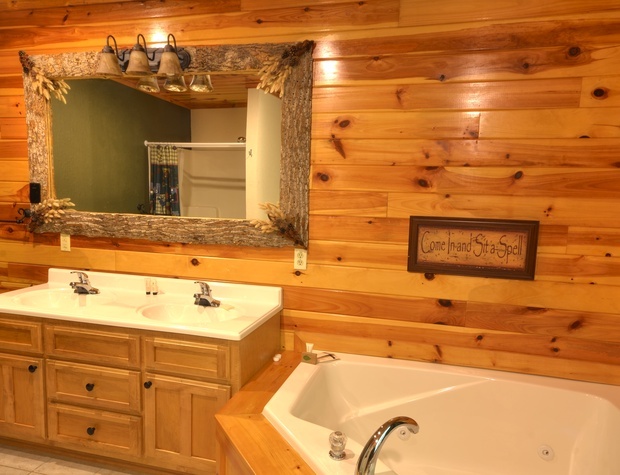 There is another separate bathroom/laundry room on the main floor. 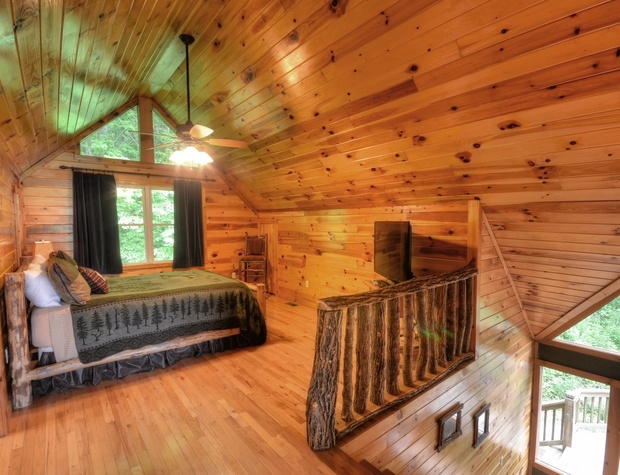 The upstairs level features a queen bedroom and private bathroom separated from the open loft part of this level by a privacy drape. 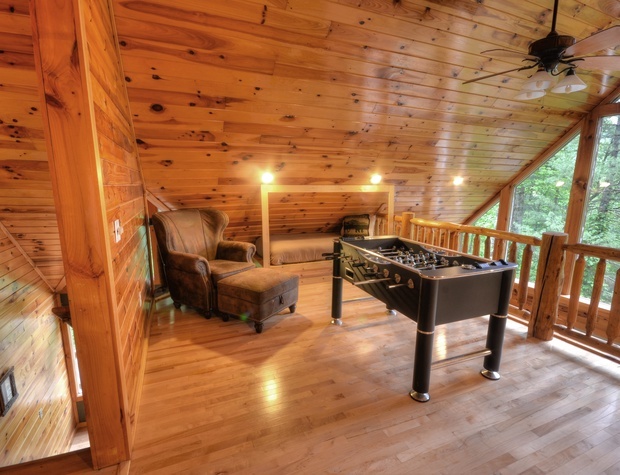 The open loft looks over the living area and shares the openness of the great room. 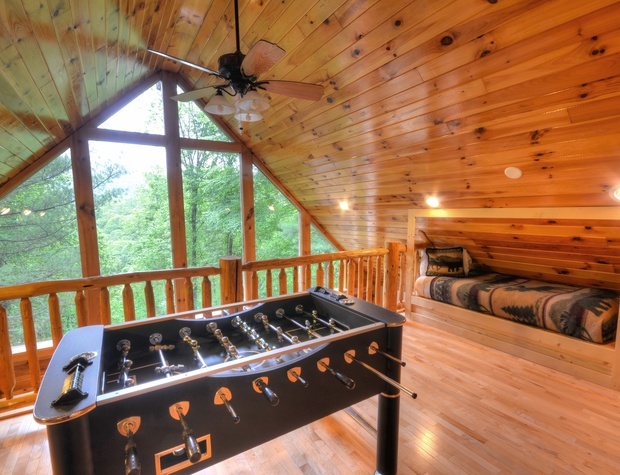 It features a Foosball table, HDTV, and extra sleeping in 2 twin bed nooks built in to either side of the vaulted ceiling.